In Roman mythology, Mercury or Mercurius (or the Greek Hermes)is the swift messenger or courier to Jupiter (Zeus) and the other gods. His many followers associated him as the important god of travel, trade and prosperity. Mercury’s mother was Maia, the daughter of Atlas, and from her union with Jupiter (Zeus), gave birth to him at dawn in a cave at Mount Cyllene in the legendary and fabulous Arcadia. During his younger days, he played the lyre at midday, which he invented from a tortoise shell – and this became the northern constellation of Lyra. The strings he obtained from cow innards, one of the many he had stolen from Apollo. Mercury’s reward for his bold cunning in stealing these cattle from under the very nose of Apollo, was his elevation to god-hood, and to be and taken to Mount Olympus to join the many other classical gods. In some of these ancient mythologies, this daring theft also made Mercury associated with thieves and robbers. This story is antithetical on a number of levels. Apollo is the opposing god of truth – Mercury is more the god of lies and treachery. (Apollo is also the celebrated for the arts, divination, as the bearer of plagues on humanity, and is the patron of archery.) From about 450 BC, these opposing views are also within the mythology of the Ancient Greeks. Like the morning and evening appearances of the planet Venus, they also thought Mercury was two different planets on opposing sides of the Sun. They named them Apollo and Hermes, corresponding to the respective observed evening and morning apparitions of the planet. These separate appearances of the same planet remained in legend well after it was determined these two bodies were one of the same body. The story of his birth at dawn, which he shares gloriously with Eos (Aurora), for example, reflects the apperance of the Hermes (Mercury) in the early morning sky. His divine music from the lyre during the middle of the day reflects the heavenly music of the gods, whispering gently on the airs of the breezes as he takes his unknown and invisible errands to the gods. He only appears again during the evening twilight, where he travels to the region of Pieria near Macedonia in northern Greece to rest. Thus he appears to the west after the setting sun. We often portray Mercury wearing golden winged shoes or sandals (talaria), a winged helmet or cap made from wool or leather (petassos), and a suitable purse or bag to hold his messages. He also carries the golden Caduceus, the winged staff with two snakes wrapped around it. In ancient times, this represented trade and commerce, but is now commonly epitomises medical organisations and hospitals, medicines and other places that heal the sick. He was formally venerated to symbolise the crops grown by the ancient rural farmers, and was celebrated by the Romans each year on 15th May, during the festival known as the Mercuralia. He was once considered the Roman protector of the important wheat trade and had his dedicated temple to worship him near the Circus Maximus in Ancient Rome from the beginning of the 5th Century B.C. The first observational records we have of Mercury were by the Mayan civilisation, who recorded the position of the planet during the morning apparition of 733 BC. The first of Mercury evening sightings we know of were given by the Mayans in 727 AD, where they had calculated that the planet would appear in the exact some position once every 6 years 8.4 days or 2,200 days. We do know observers knew about the existence of the planet well before this. I.e. Around 2200 BC the Sumerians, and later followed by the Babylonians, named Mercury as one of their seven most important gods. Equatorial : 4 879.4 km. Aptly named Mercury is the nearest planet to the Sun. It really does show quite rapid apparent movement across the sky as it passes through the constellations of the zodiac due to it orbiting the Sun once every eight-eight (88) days. Mercury’s mean solar distance spans about 0.39 Astronomical Units (AU) or 57 million kilometres. Any daytime observer observing from Mercury would see a sky full of stars because of the lack of any real atmosphere. Poised somewhere in the sky during daylight hours would be the huge 1.4° solar disk – being some three times the diameter as seen from Earth – which varies by about 0.15° through out the orbit. The crater packed surface is bathed in intense solar radiation whose surface is consequently exceedingly hot – enough in fact to melt lead. Observers would see the sun shining about -29.3 magnitude, more than three magnitudes brighter than observed from Earth at −26. Alternatively, if you could stand on the night time surface, then looking back towards Earth would find a very bright bluish ‘star’ that during opposition would shine around −4.8 magnitude, while Venus would exceed −7.7 magnitude! Once each 116 day synodic period, the planet experiences an inferior conjunction and enlarges to some 12±1 arc seconds across. At the times during the more distant superior conjunction, this size can shrink to 4.5±1.0 arc seconds. Over this whole cycle, the telescopic appearance of Mercury shows regular phases that slowly wax and wane like the Moon or Venus. Mercury’s Due to the high orbital eccentricity, both the true distance and elongation of Mercury changes considerably between successive apparitions. Due to the high 7° orbital ecliptic inclination is also high, the planet does not undergo successive transits across the solar disk each orbit. Transits may occur once either every seven, eleven or forty-six years but preferentially around either the 7th May or 9th November. (See Transit of Mercury) Previous recent transits occurred on 15th November 1999 and 07th May 2003, and the last being on the 09th November 2006. Another transit will again happen until 10th May 2016 then again on 12th November 2019. Being so close to the Sun, the midday temperatures may soar as high as 450°C, or plummets in the darkness of shadows or at night to −170°C. An average daytime temperature is more like 320°C, being no an air temperature by the temperature of the material. 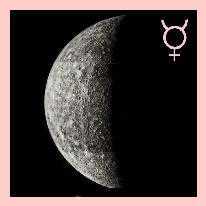 (Mercury is airless) Mercury’s axial rotation is about 59.7 days or about two-thirds the orbital period. An average length of the ‘day’ between successive sunrises is roughly 175.4 days. Proximity to the Sun immediately suggests that more high velocity meteors, comets and asteroids, once heavily bombarded and pulverised Mercury. This is more so than any other planet than our Solar System.